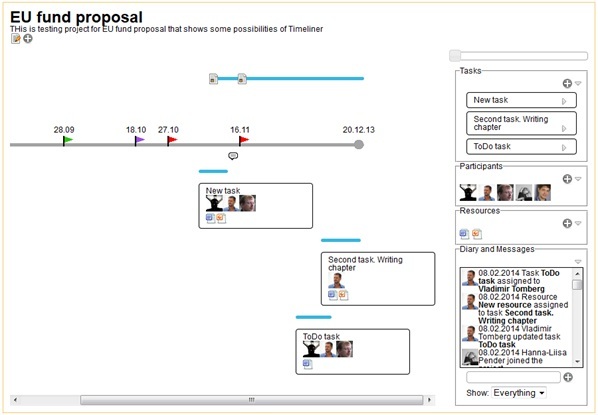 The initial idea of Timeliner (figure 1) was to create a tool which could help to researchers to set up and manage collaborative writing project. The aims we pursued were tracking milestones related to Calls for Papers, finding right time slots for collaboration, setting up documents, arranging tasks and collecting appropriate resources. 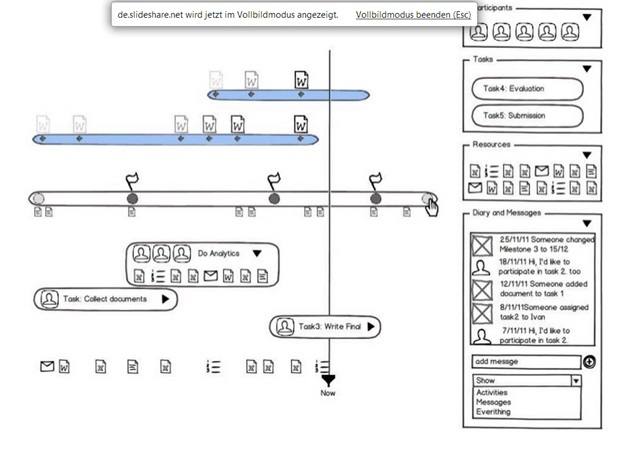 Combined chat and activity stream that allow to track activities in consequence with comments. Basically, informal learning is understood to be episodic and highly contextualized (Eraut, 2000). The corresponding experience is mostly triggered by certain problem, learning need, discrepancy between the own understanding and the reality etc. Thereby, the informal learning experience often involves other (trusted) persons, and leads to a group/ social context (Marsick & Volpe, 1999; National School Boards Association, 2007). In other words, informal learning can lead to a complex situation with many interwoven actors and artifacts that requires establishing a shared understanding over and over again to be able to collaboratively solve it and achieve a socially accepted meaning in the end. The mean to achieve this goal is intersubjective meaning making, which is reflected in the composition of interrelated manipulations of digital artifacts by the collaborators (Suthers, 2006). Hence, intersubjective meaning making has to considered thoroughly and supported meaningfully (based on a theoretical model). Additionally, the current status of the Integrator (vertical line) could be used to generate a graph of the involved part of the Artifact Actor Network (AAN; Reinhardt et al., 2009) reflected by the Social Semantic Server (SSN; Kowald et al., 2013) . 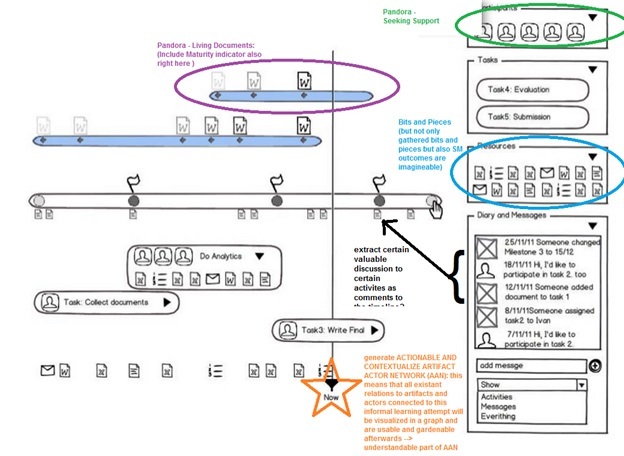 This part of the AAN would be a highly contextualized version, because it includes all the artifacts and actors involved in this informal learning attempt in detail (e.g. which person contributed to which version of the final document) and highly actionable, because just an excerpt of the full AAN can be fully understood and enable actions based on it. 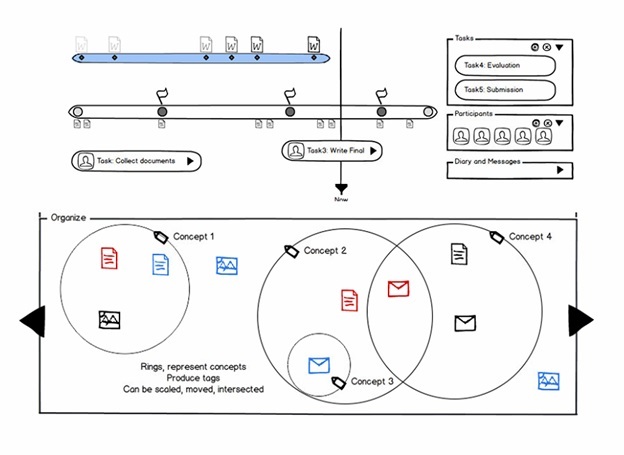 In conclusion, this visualization of the contextualized and actionable AAN would provide another sight on the informal learning attempt and enable the learner to extend and garden it based on their real world understanding. Besides, certain important and crucial states of this contextualized and actionable AAN could be marked and saved after gardening to feed them back into the collective understanding. Eraut, M. (2000). Non-formal learning and tacit knowledge in professional work. The British journal of educational psychology, 70 ( Pt 1), 113–36. Kowald, D., Dennerlein, S., Theiler, D., Walk, S. & Trattner, C. (2013). The Social Semantic Server – A Framework to Provide Services on Social Semantic Network Data. In Proceedings of the I-Semantics. Lowry, P., Curtis, A., & Lowry, M. (2004). Building a Taxonomy and Nomenclature of Collaborative Writing to Improve Interdisciplinary Research and Practice. Paul Benjamin Lowry. Journal of Business Communication, 41 (66). Marsick, V. J., & Volpe, M. (1999). The Nature and Need for Informal Learning. Advances in Developing Human Resources, 1(3), 1–9. National School Boards Association, N. (National S. T. A. 2007). Creating and connecting: Research and guidelines on social – and educational – networking. Retrieved from http://www.nsta.org/about/positions/informal.aspx (accessed June 20, 2013).